First of all, let me welcome our new friend here Ricardo Mollinedo. Until now, we have received 8 responses from readers for the post Welcome BMW E36 blog readers!. Well, I still hope that I receive more response from the loyal readers of this blog. So, please if you are a reader of BMW E36 blog, please submit your information here (Welcome BMW E36 blog readers!). We will be glad to hear from you!. Today’s post is about BMW E36 fog lights removal. I was thinking that this is a very hard task to do because I already tried it on my car and it was just hard. The problem is that the fog lights are in a very bad place that you can’t easily remove or change as my car is maybe 10cm above the ground. This means that every time I needed to change a burned bulb or something, I had to dig deep until I reach it. It seems that this plan was not very good and that there’s a much easier way to do it. So, if you either looking for changing your burned light or want to change/clean your fog lights, this post is for you. I hope you find it useful. money while fixing your car. Disclaimer: Use this info at your own risk!! I’m not responsible if this didn’t work for you :-). The fog lights on the E36 are prone to stone chips because they are so low on the ground and can also crack due to thermal stress if buy baclofen, zithromax without prescription. you go through a puddle of water when they are hot. Fortunately they are easy and not too expensive to replace. German & Swedish sell original quality replacements for 60$ or alternative ones for 40$. Pictured below is the drivers side brake duct and fog light. To release the fog light all you need to do is insert a screw driver in the hole at the top and push the releasing clip forwards. The fog light will then pivot on the opposite side and come out. 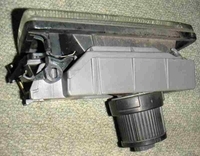 The picture below shows the release clip on the left and the pivot point on the right of the photo. If this plastic clip has broken then it is more difficult to remove the fog light. You need to remove the 4 bolts and 2 plastic rivets holding the plastic panel underneath to the bumper. You will probably have to force the rivets out and buy a couple more. They are only about 12p each from a dealer. Once the panel is off then raise the wheel up a little by for example driving onto a kerb and put your head underneath. The picture below is what you should be able to see. You will need to hook a flat bit of metal over the top of the bracket and down between the bracket and other side of the lever and then twist it. The finished result. You might wish to replace the fog light the opposite side as well as you can see from my photo the old fog light glass discolors after a while. Repairing BMW E36 A/M Gearbox Light . . . DIY! Fixing BMW E36 Trip Odometer LCD . . . DIY! Making your BMW Angel Eyes Fadeout . . . DIY! Changing BMW E36 Microfilter . . . DIY! This entry was posted on Monday, August 27th, 2007 at 5:18 am and is filed under Do It Yourself, Exterior, Technical Info, Tips & Tricks. You can follow any responses to this entry through the RSS 2.0 feed. You can leave a response, or trackback from your own site. This is so easy and fast I do it before I track my car. Pop out the fog lights and store them in my track-side bin until I’m done. Pop them back in and drive home. have you found any instructions for doing it for a non-M e36? I can see no way of getting to the fog lights from front or behind the wheel well without removing the wheels… please advise! You are here : Home » BMW E36 Fog lights removal . . . DIY!